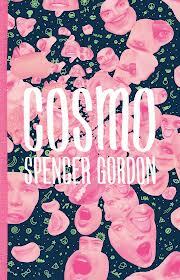 Winner of the CBC's 2013 Overlookie Bookie Award for Most Underrated Canadian Book, Spencer Gordon's Cosmo (Coach House, 2012) is spritely, clever, funny, thoughtful, and restrained. That last adjective may seem odd. It seems odd to me, given the wide ranging playfulness of this short story collection, but it's a thought that recurred as I made my way through the book. Restrained, how? In emotion, surely. In perspective, perhaps. In aesthetic approach, maybe. In interests, not sure I would go that far. Two of the stories begin with quotations from giants of American post-moderism: David Foster Wallace and Donald Barthelme. And the anxiety of influence is clear throughout. These stories seek to bend form, play games of the mind, articulate multiple layers of surface, foreground the artifice of the story itself, make the reader hyper aware of frames, and celebrate the swirl of language, carefully. The carefully part is the restrained part. There is much intelligence here and much authorial control. The narratives are strong and assured. The paragraphs, short or long, are well manufactured. Strangely (? ), the book I read immediately before this one was Not Knowing, essays and interviews with Donald Barthelme. In one of the interviews Barthelme is asked to identify the biggest weakness in his writing. Or perhaps his biggest regret. Emotion, he ways. He wished he'd included more emotion. And fewer jokes. He also asserts repeatedly that he is a "realist" because art articulates the tropics of the mind. Having read these two books so closely back-to-back, it's impossible for me not to draw comparisons. I feel that Cosmo could have used more emotion, though also more jokes, and less restraint. Perhaps an "s" could have been added to the title. Cosmos. I realize these are purely subjective tastes, and suggestions, so I will try now to say something more objective. As others have noted, "authenticity" is a recurrent concern in this collection. The first sentence of the first story: "This is authentic, Crystle thought." These five words are just lovely. The italics. The concise "thought." The begged question: what is? The inauthentic "Crystle," who turns out to be Miss U.S.A. aboard an American military vessel in South Asia on a medical-humanitarian mission to aid cleft-lipped children. This is a fantastic set-up. The beauty queen, the U.S. military, the child victims of random cruel circumstance. It is real because it is real; such things happen; but it is also highly "made;" it is an organized event, a deliberate placing of idealized pageant contestants with the randomly displaced. In other words, exactly the kind of "media event" that takes place every day and which can only be called authentic after it's been filtered through tough-fibered layers of skepticism. Gordon gives us this skepticism, but he also keeps the reader buoyed well above cynicism. There's that restraint again. Crystle is moved by the suffering children, even as she has panic attacks about her biggest fear: falling down on the runway mid-pageant. This is authentic? We should care? Even as I admired the writing, I wasn't sure. But it got me to thinking along the lines of what did Andy Warhol have to say about the Holocaust? I popped the two terms in Google and came up with this....: "Sculptor George Segal created this work entitled The Holocaust. The memorial is at the location of the Legion of Honor and overlooking the Bay at Lands End. Segal is considered an important figure in the Pop Art movement which includes Roy Lichtenstein and Andy Warhol." Barthelme repeatedly insists that he's not ignoring social realities, and that his work references, among other things, the Vietnam War, racial strife, poverty and other social conditions. It just doesn't foreground those things; it foregrounds the activities of the mind (while also acknowledging the place-in-time context). Cosmo lives up to both of these, and I salute it. It is difficult and a riddle; it is art. The Underground Book Club is a blog by Michael Bryson, founder of The Danforth Review, displaying content new and recycled. Special, but not exclusive, focus on Canadian literature. A work in progress.